Last night we slept with the windows open and awoke this morning to a temperature of 49 degrees. 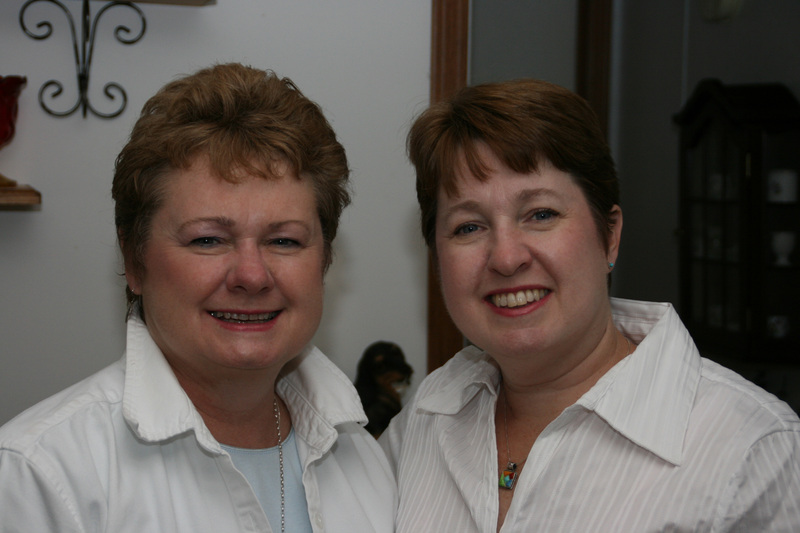 My sister and I were chilly but were still too groggy to get dressed for the day. I mean my gosh we hadn’t even had a cup of java to breath life into us yet. So I grabbed a couple of old plaid flannel shirts to throw over our night gowns. She was still a little cool so she put on a pair of jeans. She looked very sophisticated in her morning ensemble, baggy white night shirt, blue plaid flannel shirt, unbuttoned of course, blue jeans, and a pair of hot pink and white striped flop flop slippers. 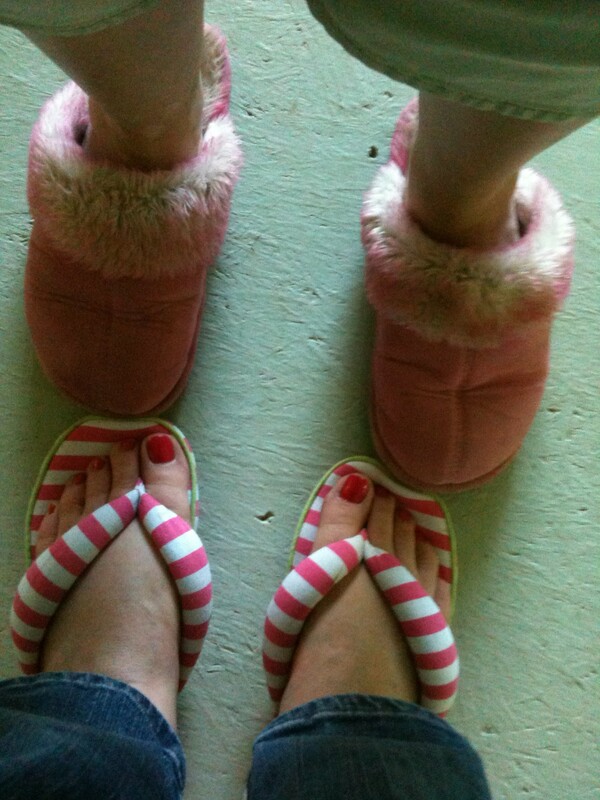 Oh, and the matching pink toenail polish topped off the look along with a bed head of frizzy blonde hair. I also looked quite stunning in my ballooned out nightgown, green plaid flannel shirt, and fuzzy pink slippers. I believe my high class coif was pushed up and pressed to one side. Very Vogue. With bleary eyes I prepared the coffee pot. I put a little extra scoop in because my sister likes coffee that curls up your toes when you take a sip. That’s ok I could use it a little stronger after the wine we had last night. I’m not much of a drinker. Could my sister be a bad influence on her little sister? I’m just kidding. About the wine. The coffee was just starting to take affect. We would have given it to each other intravenously, but that just wouldn’t be right. She could of handled that though since she is a retired nurse. Our eyes were just beginning to focus and the joints were becoming mobile when what do we hear? The Green Goblin. Here it came squeaking and bouncing up the driveway. Since my sister was more modestly clothed she had to answer the door while I sprinted to the back of the house to put on something more appropriate. Ronald and Vicki came by to help clear out the garage and get it ready for the cement to be poured tomorrow. Thank goodness, another job will be done. The garage will be finished and the root cellar foundation will be ready for the block layers. An hour later my sister and I were sipping a second cup. It was time to get the laundry going and plan the next flowers we want to plant. It is great to have her here. It like a comedy show everyday and we know that laughter is good for the soul. So is an older sister who is always there for you and loves you for your goofy self. 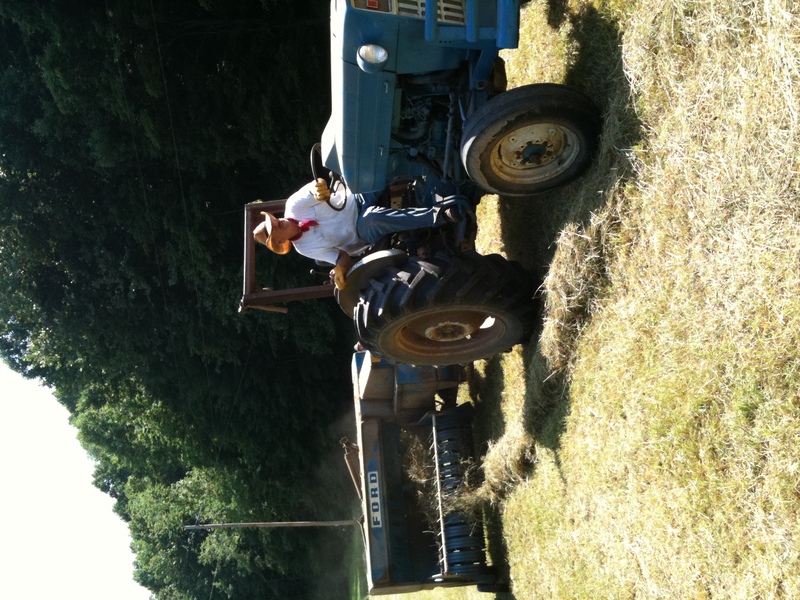 June is typically the early cut month where many in the East start bailing hay. We will be back in September for the second cut. Some make square bails and other do rolls. John raised miniature donkeys so square bails suit him. They typically stock about 500 or so in his loft to make it through the fall and winter each year. I think the trailer handled about 75 bails stacked on it. 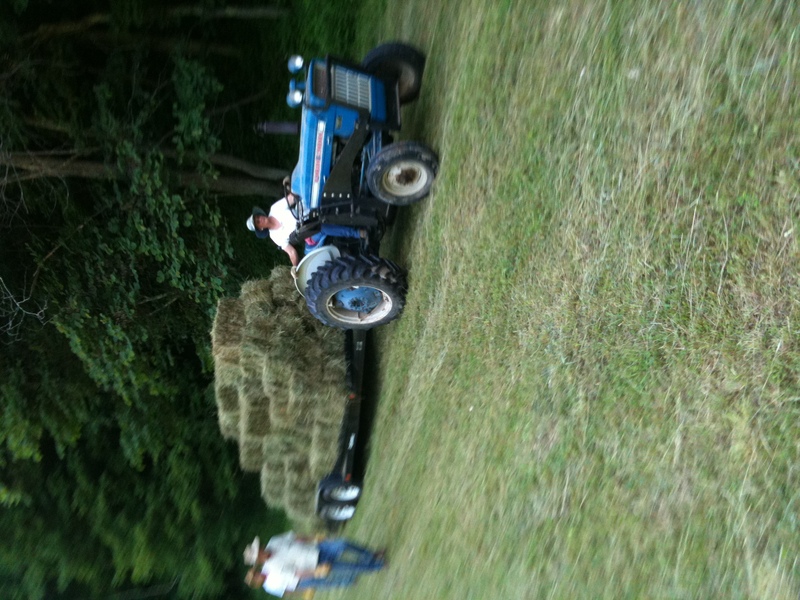 On Tuesday he cut the hay field and afterwards there were several good sunny days for curing. John went out a couple of mornings when the dew was clear to ted for even better drying. Then on Thursday he changed out the tedder on his Ford tractor for the rake and about 2pm got to the field and started raking his windrows in the field. 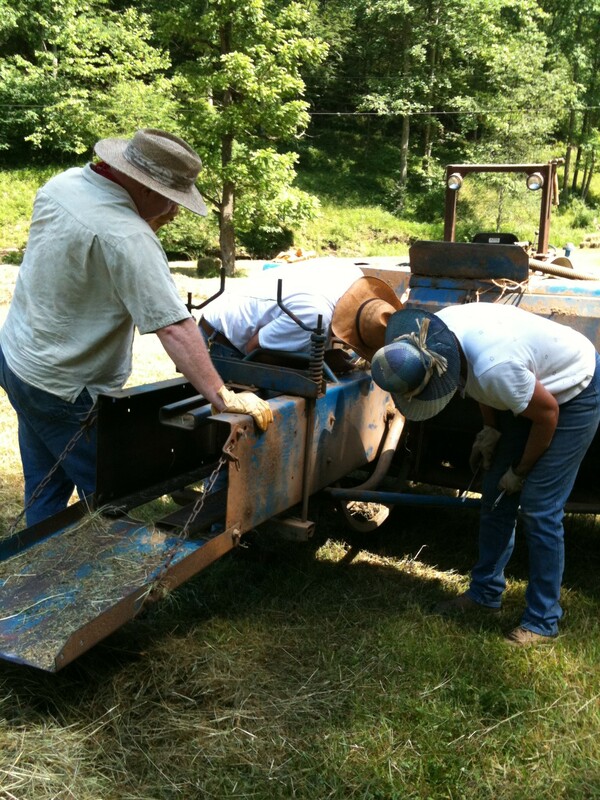 On Friday morning the tractor was ready to go with the bailer hooked up, by mid-day John was making rows. Linda and I showed up mid afternoon to give him a hand. Now with the rows cured and ready to go, John got busy. Linda and I grabbed John’s other tractor that was already connected to the car trailer and we started stacking the bails from the fields. While Linda and I got started loading the bails on the trailer, we noticed John and Carol on the far side of the field behind the bailer. Seemed the twine broke several times and the knotting thingy (a technical term) was hung up. Using pliers, a knife and a couple dozen bad words they got it fixed up and were back to bailing. After a couple of trips to the barn we got the hay in the loft we were finished. John worked me until I was exhausted. I was toast. I quickly gained a new respect for what John and the farmer goes through. I thought to myself…this was just hay today. Thinking back I think John still had plenty of gas left in him. We have had a busy but wonderful week. Our son Harold and his wife Clarissa came for a long over due visit. Since our time with them is so precious I put the blog on hold. Our daughter-in-law is due to have our first grandchild ( a boy ) at the end of October. We made a quick trip to Delaware to visit grandparents and extended family. When Harold and Clarissa left, their PT Cruiser was loaded down with baby gifts, and they still have to go to Virginia Beach to visit her family. I would suggest they rent a U-haul to get everything back to Texas. Either that or tie their Border Collie to hood of the car. Pothole Farm is in full bloom. The grape vines are taking off, the holly hocks are flowering and the garden is lush. We picked our first squash and zucchini. They were quite tasty skewered between tender beef, red onions, and colorful peppers basted with Harold’s Teriyaki sauce and grilled. Mmmm, mouthwatering. Before long the garden will be filled with ripe vegetables and the harvest will begin. I am not sure I will be able to keep up. We were sorry to see Harold and Clarissa go, but it is what we as parents strive to achieve. Like birds we nurture them, watch as they stretch and exercise their fledgling wings, teetering on the nest edge and finally taking flight to a life of their own. I think we did well, but it’s nice when they come back and visit the old home nest. ZAPPED! My sister came back with me from Delaware. She was ready for a little of the peace and quiet of Pothole Farm. A few lazy days sitting on the porch swing sipping iced tea and reading a magazine, or a nice stroll down the country road, maybe pick a few berries or look for turkey feathers. As soon as we arrived she wanted to see all the improvements we have made. I took her for a tour around the property, proudly pointing out our new chicken house, garage and soon to be completed root cellar. Our last stop was the garden. As you know we have a solar electric wire that runs across the top of the fence and even above the gate. She did fine entering the garden and I didn’t think to mention that you need to watch your head as you pass under the electric wire. We walked up and down the rows admiring the plants and counting the nubs of future squash and zucchini. We twined the wild vines of Lima beans around the fence wires and marveled at the growth of the sweet potatoes and pumpkins. It all met her approval as she strutted in a queenly fashion ahead of me as all older sisters do. She opened the gate and started to walk through. I heard a sound that I can only describe as a the sizzle and snap of a piece of battered chicken being dropped into hot oil. She stood there stunned, looking at me with dime sized pupils. Oh, I said sheepishly, I forgot to mention the electric wire. We laughed hysterically. At least we know it works. Maybe that will knock some sense into her. Oh, and the lazy days sitting on the swing sipping tea? Not happening. There’s work to do on Pothole Farm. After the last big frost in May, Sonny and I thought the grape vines we put out had passed on to the great garden in the sky. We really didn’t pay anymore attention to them and chucked the loss up to experience. With so much construction going on around here we decided to wait until next year to replace them. 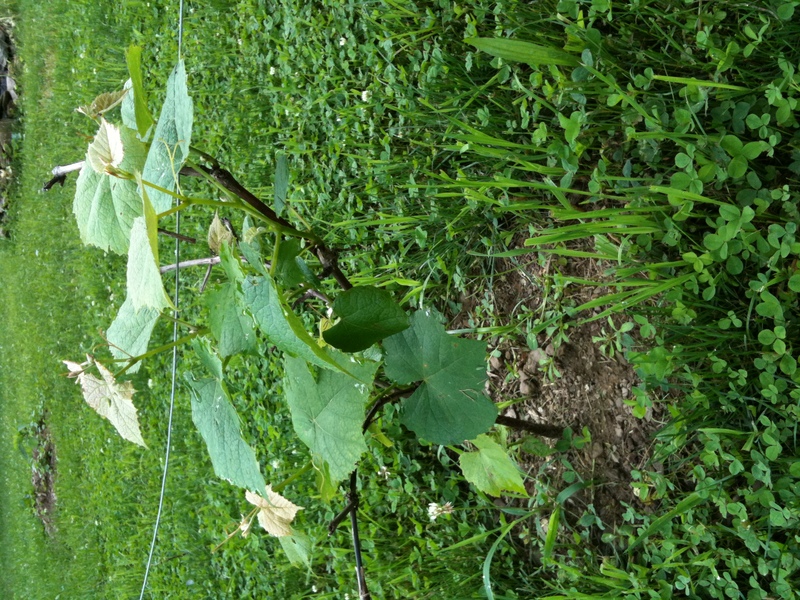 We were pleasantly surprised last week when we saw new leaves on all three vines. They seem to be thriving now. They must be some tough plants. Speaking of thriving the garden has really taken off with all the rain we have had in the past few weeks. It is difficult to keep all the grass and weeds out since it is so wet but the plants seem to be loving it. So far the only problem we have had is some black fleas on some of the plants, especially the potatoes. I’m not sure if that is the correct name for these bugs, but that is what Ronald called them. I put some seven dust out to kill them. It would be great to have a totally organic garden, but I don’t know enough about it at this point. 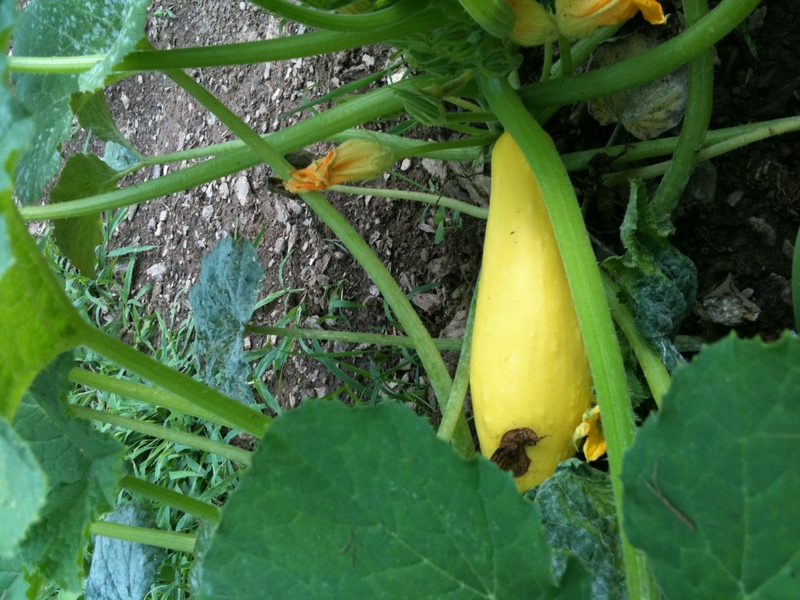 The zucchinis have blooms and so does my yellow squash and tomatoes. It won’t be long before the pumpkins and sweet potatoes take over the far end of the garden. They still have a lot of growing to do. Only a few of the green bean plants came up. I’m not sure but it is possible birds may have eaten some of the seed. I threw a few more in the ground and we will see what happens. A few more weeks and hopefully we will be able to start enjoying the bounty. Well the Root Cellar project has broke ground and moving forward. Ronald had the Kubota backhoe operator out today to dig the footer and level out the location where the concrete will be poured. Before they even got started they had to put in a 10′ x 8″ drain pipe in the water drain ditch in front and cover it up to allow the equipment to go across for access to the digging area. On an earlier supply run they had already picked up the rectangle drain material that will be mounted inside the footer to allow for a good drain system. 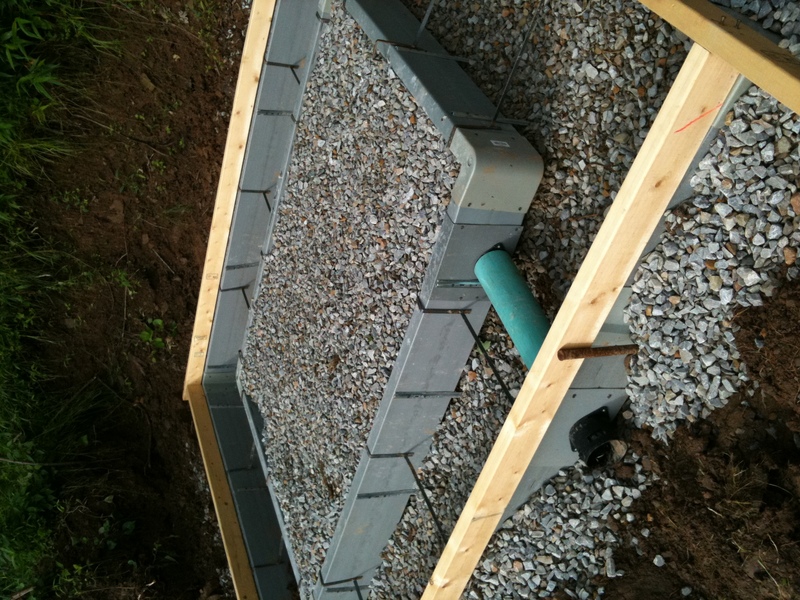 This drain box material is also installed on the inside where the floor drain will be located. The backhoe was able to do much of the digging but the far side turned out to be a problem not allowing the bucket to get into position. After Ronald, Vicki and Paul did some serious digging they were able to finish. Next will be adding some additional gravel and calling in the concrete truck to get the footers and foundation poured. They will also be pouring the Barn floor and entry ramp. Please Stand-By. The woodshed is ready and waiting to be filled with a few cords of firewood. Sonny and I just have to get out there with the chain saw and start cutting up some of the fallen trees that are laying around. We better get to work real soon to ensure our nut is covered before winter. If we cut down any fresh trees the wood will need time to dry. In general green wood doesn’t burn very well. It’s hard to get the fire started and it tends to create a lot of smoke and eventual problems. It’s difficult to motivate ourselves to cut firewood when it’s 85-90 degrees outside, but come winter when it’s -5 we’ll be thankful we did. 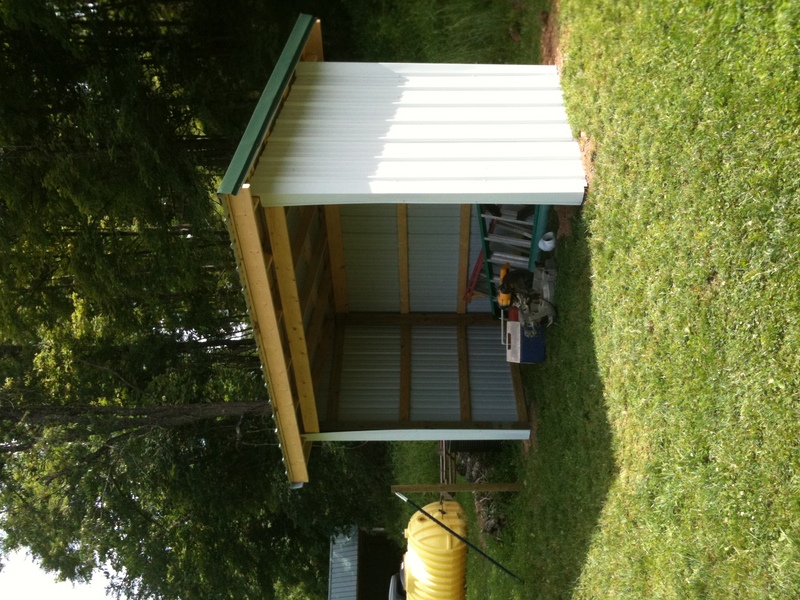 The outside of the chicken coop is finished. It is not fancy by any means. I don’t really care for the metal covering the chicken doors and plan to take it off and paint them instead. I can’t do that though until the treated wood has cured for about a year. We have a window in the entry door, but I’m thinking we should have put in another window on the side wall. We will have to see how it works out. The chickens probably won’t care one way or the other as long as they are safe and protected from predators and the elements. That is the thing with hen houses, they come in all types and styles. Some fancy, some nailed together with scraps of wood, some prettily painted with window boxes and others are plain. It’s all in how creative you want to be. I think I would like to be a little creative. Yesterday we picked up the T-posts and 50′ of wire fencing. Can’t get the chickens until a fence is up. We also bought a hanging feeder and waterer. In doing research we have read that the hanging ones help keep the chickens from pooping in their food and water. Never having had chickens before we can only imagine the mess they probably make. I’ll let you know if the eggs are worth the mess. We continue to search for the best and easiest way to keep them clean. Ronald put up six laying boxes for us. At first we laughed cause the boxes looked so tiny, but apparently the chickens don’t need a lot of room to lay their eggs. I imagined our hens straddling the boxes, their toes hanging on the edges as they squeezed out an egg. Not a pretty thought. Paul, Ronald’s grandson and our “go to” chicken man, assured us that the hens would be happy and have plenty of room to sit. I guess we can believe him since he had award winning eggs in the FFA this year. Right now we purchase our eggs from him until we get our own laying hens. They are a thousand times better than the store bought eggs. Nice orange yellow yolks and oh so fresh. Some of the best layers are the Rhode Island Reds or Red Stars. Those are the ones we plan to get, but we will most likely have to order them online. We went down to the local Southern States store yesterday to do just that but they only order the pullets in the first week of September. Paul told us that we can order them from McMurray Hatchery. They are a well established hatchery dealing in not only laying hens, but exotic chickens as well as ducks and other fowl. So in a nut shell, or should I say egg shell, we are not far from embarking on a chicken adventure. Hop on the back of the tractor and we’ll take you along. My skin was always Lilly white, from my toes up to my head. When the sun shine hit upon me, I glowed like the ghostly dead. When working in the garden, I wear a straw hat to cover my hair. The doctor said I should wear sunscreen, to protect my skin so fair. I toiled happily in the sun, as I hoed and planted my land. The sun screen sweated all away, now I’m left with a Farmers Tan. 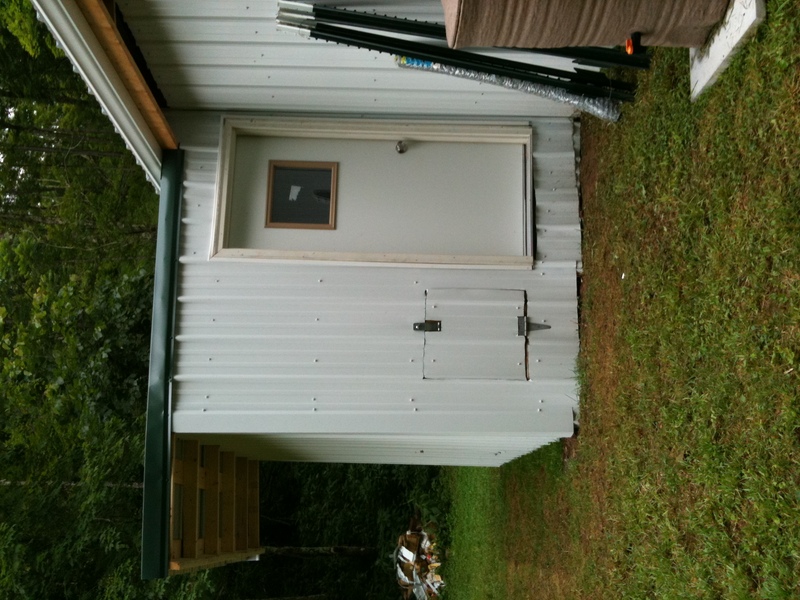 You are currently browsing the Off-Grid in West Virginia blog archives for June, 2010.